Sweden ranks alongside Germany is the EU nation hardest hit by the insane ‘open doors’ immigration policy ‘recommedned’ by the EU and willingly embraced by elitists who do not have to live among the uneducated, illiterate, insanitary and sexually incontinent scumbags who were waved through the border without even being asked if they had a not from their mothers to identify them. Public despair as the descent of the country from Europes safest and most pleasant place to live into a lawless third world shithole led to an inconclusive election in September, since when the nation has been without a working government. Moderate and centre-right voters in Sweden increasingly believe working with the Sweden Democrats is a workable compromise to give Sweden a government, and to influence how the country is run in the future. In a newly released poll, voters of both the Moderates and the Christian Democrats agree that the party should look toward some kind of talks with the populists. According to the poll, conducted by Novus for Swedish broadcaster SVT, 85 per cent of Moderate voters and 83 per cent of Christian Democrat voters (i.e. both centre right parties,) held a favourable view of working with the SD. The call to negotiate with the SD was also been favoured by a majority of Moderate politicians in a similar poll that was conducted shortly after the election in September. “We Moderates want the party in the Riksdag to actively pursue moderate policies and counteract socialism. If this is only possible with SD, it is worth negotiating with Åkesson,” one member said at the time. When Donald Trump, currently frontrunner in the contest to be Republican Party candidate in the USA’s 2016 Presidential Election, in a campaign broadcast commented that Islamisation of the west has gone so far parts of London are so heavily populated with Muslim extremists there are now no go zones for police and emergency services, he was attacked by politicians and the mainstream media. The flow of undocumented migrants from Africa trying to cross the Mediterranean from the coast of Libya to Italian, Greek and Maltese territory seems unstoppable. Two factors in the problem however have been western (particlarly American meddling in the internal affairs of African states, and wester aid leading to a population explosion national infrastructures are unable to cope with. And of course European leaders haven’t a clue how to deal with the problem. SWEDEN’S election results are crawling in and there looks to be no clear winner so far as has happened in other EU nations including Germany, Italy and Spain recently. Anti-immigration party Sweden Democrats are in third place, amid allegations from voters that there were no Sweden Democrat voting papers available when they went to vote. (In Swedens regional list system each party has its own ballot paper and voters put candidates in order of preference.) They could still take a key role in shaping the next government as one of the most complicated ballots in the bitterly divided country’s history has resulted in deadlock. Two parties are key to this year’s election in Sweden: The leftist Social Democrats and Eurosceptic, anti – immigration Sweden Democrats. The ruling Social Democrats are currently ahead as the election results come in, despite support for the party slumping in recent months. Prime Minister Stefan Lofven has not confirmed whether there will be a coalition, although it seems inevitable as his party is well short of a majority, and even with the support of all left and centre left parties could not govern without support from some right wing parties. He has said he will remain in office in the coming weeks oending negotiations to form a new government. Meanwhile, the Sweden Democrats have seen a surge in backing and could end up as kingmakers after tonight’s election. 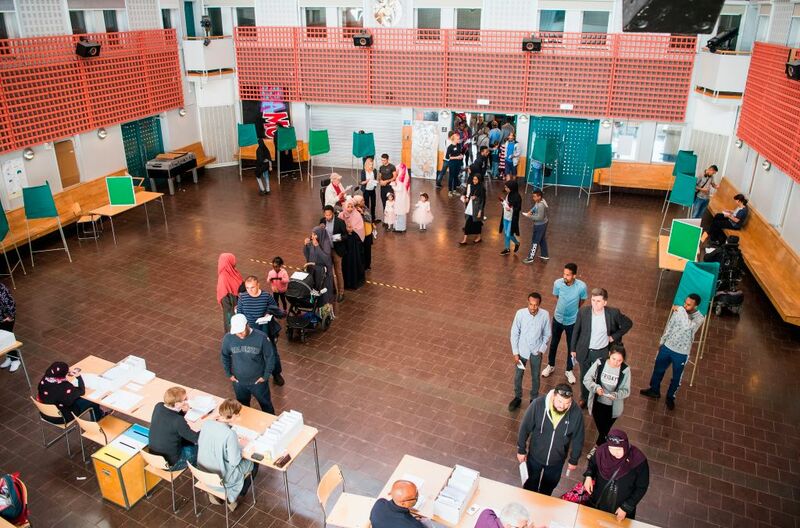 The first time a Swedish election has been monitored by the Organization for Security and Cooperation in Europe (OSCE), observers have expressed “shock” at the nation’s “undemocratic” system. The foreign policy spokesman for Denmark’s liberal governing party Venstre, Jensen said the major issue with the Swedish election system is the lack of privacy for citizens casting their ballot. Separate parties have separate ballot papers in Sweden, the choosing of which takes place in public, as voters must select their preferred ballot papers before placing them into a ballot box. “It is just so far beneath anything remotely resembling European election standards, or anything we would allow even in Eastern Europe,” he said. Jensen told the Danish newspaper how, outside of official monitoring duties, he visited a number of polling places in Malmö to see, ‘with his own eyes’, voting take place, and found “party soldiers” standing in front of the stations, where they were trying to hand voters ballot papers for their respective parties. As chairman of Denmark’s delegation to the Council of Europe, the organisation responsible for the European Court of Human Rights (ECHR), Jensen hopes to bring attention to problems with the Swedish election system. “I will highlight the issue with the Council of Europe so that we can hopefully send the strongest possible signals to Sweden that they should introduce the sort of rules seen in Denmark and in virtually every other country in the world,” he said. Speaking on the outcome of the Swedish election, which saw the worst result in 100 years for the ruling Social Democrats, the Danish foreign minister also hit out at the refusal of mainstream parties to cooperate in any way with the populist Sweden Democrats, which this year secured its largest ever share of the vote.